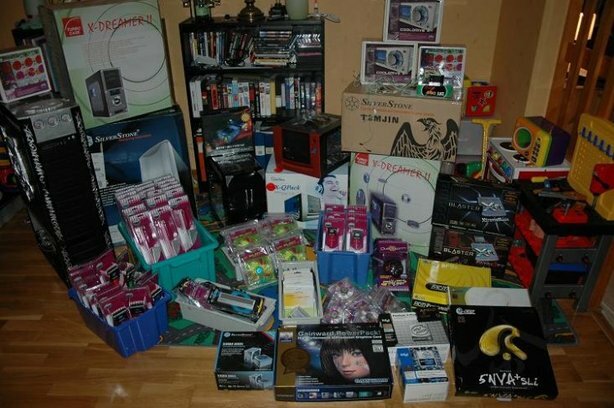 There is nothing like a good LAN party to get your adrenalin pumping, and the bigger the better. But exactly how big is 'big' ? In the UK, the biggest LAN events are organised by Multiplay like the recent 900-gamer i26. In the US, there are Quakecons, CPL events and many others. Europeans go nuts for a big LAN: in Germany, it has been known for there to be two competing 3000-player LANs on the same weekend, and both be sold out! Yet the crown for the biggest single event belongs to the Swedes: Dreamhack is "the world's largest computer festival" and is expected to attract some 6,000 people to Jönköping, west of Stockholm, Sweden when Dreamhack Winter 2005 kicks off next week, 24-27 November. The 4-day event is held twice annually in the Elmia exhibition centre, spread over two halls, the main one of which is 10,000 square metres. Far more goes on than just 96 hours of Counter-Strike, pizza and leeching from the 5Gbit/s net connection: the term 'computer festival' really is accurate. Aside from the PC gaming tournaments (including VIA's Quake 4 tournament), Dreamhack also attract members of the Demo party scene: elite coders who challenge each other to pack slick visualisation routines / animations and pumping music into stupidly tiny files; similar to the Finnish Assembly demo party. If you prefer hardware to software, there will be an Overclocking Record in conjunction with the boys from techsweden.org. Console fans need not feel left out: there are plenty of console tournaments as well as the Swedish DDR Championship Dance Dance Revolution Exteme and Swedish Nintendo Championship. Don't be fooled into thinking that Dreamhack is just for Swedes - gamers from all over Europe attend, and I'm sure there are even a few crazy Americans who will make the trip across The Pond. Certainly within Europe, there are several Budget Airlines that can fly you to Sweden - too many to list, but you might find it is cheaper than you think. Pack the laptop and go forth in search of trophy frags and Swedish babes. What has all this got to do with bit-tech? While we won't be there in an official capacity, we have a man on the inside: Micke 'GoTaLL" Gustafsson, our resident engraving guru. Micke is a native Swede, and lives close to where all the action will be. Local distributor Colorcase.se will have a stand, and Micke will be on hand to engrave cases, laptops or whatever you like during the event. Last year, he proved so popular that company reps from Abit, Intel, NVIDIA and Razor all asked him to engrave stuff for them. Micke's involvement is much more substantial this year: aware of his reputation, he has been asked to build several demo systems and custom cases for Dreamhack Winter 2005. Generously supported by Adata, AMD, Colorcase, Creative, Epox, Gainward, Intel, OCZ and Xtreme, he has produced no fewer than seven cases. The trouble is, when given this mountain of hardware, where does one start? Below are some quick links if you want to jump to your favourite project.